Four senior Cadets from the Bermuda Sea Cadet Corps are going to test their seamanship and leadership skills when they crew tall ships taking part in a 7,000-mile transatlantic voyage. There are more than 50 vessels taking part in some or all of the Rendez-Vous 2017 Tall Ships Regatta to mark the 150th Anniversary of the Canadian Confederation through its founders and founding provinces, and 19 will be coming to Bermuda later this month. Petty Officer Cadet A Buckley and Ordinary Cadet G DeBraga will be sailing from Boston to Charlottetown on different vessels; Petty Officer Cadet J Johnston will be sailing from Miramichi, New Brunswick to Quebec; and Leading Cadet M Ricketts will sail the longest leg, from Halifax to Le Havre, France, where the race is due to finish on September 3. The costs of the four Cadets’ voyages are all being supported through substantial bursaries provided by the Sail Training Association Bermuda. The balance of their voyage costs will be provided by the Bermuda Sea Cadet Corps, as part of the Cadet training opportunities, thanks to the fundraising efforts of all of the Cadets. Lt Cdr [SCC] Michael Frith, RNR, Commander, Bermuda Sea Cadet Corps, said: “This will be an incredible experience for these four young people. POC Buckley is going to crew the Bark Europa and has never experienced life on board a tall ship, and said: “I am looking forward to seeing what it’s like on a tall ship voyage. He said that Sea Cadets has taught him basic seamanship and helped him get his small craft operations and VHF radio qualifications, as well as supporting him in his application to take part in the voyage. “I’m looking forward mostly to meeting new people. To meet people from all different backgrounds that all have similar interests as me,” said LC Ricketts, who will be sailing on Alexander von Humbolt II. “I really look forward to being able to look back on the experience and being proud of sailing across the Atlantic. “Without the Sea Cadets, I wouldn’t have thought about participating. I wouldn’t have known that this is something that I would want to do in the first place if it wasn’t for sailing within the programme. And OC DeBraga, who wants to join the US Coastguard, said: “I am looking forward to being on the ocean for several days and getting as much experience as possible. 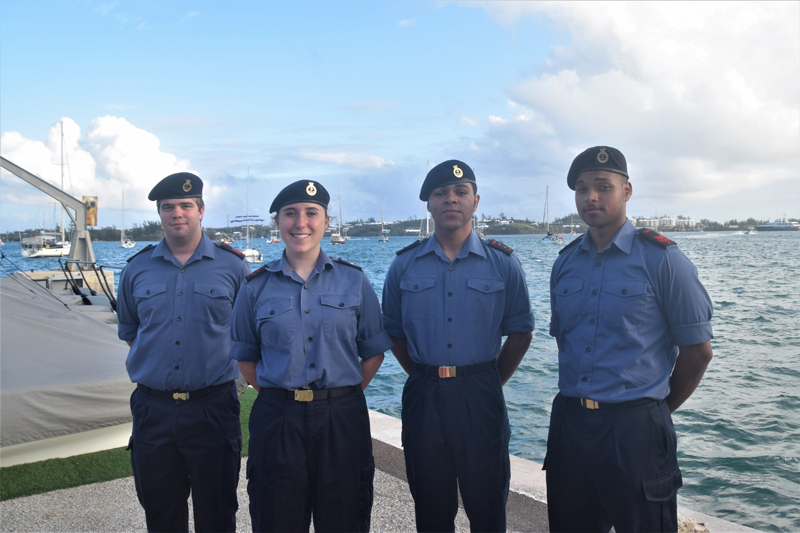 SLt [SCC] Sam Bennet, RNR, Training Officer for the Bermuda Sea Cadet Corps, said the aim of the Sea Cadet programme was to provide cadets with as many different experiences as possible, to help develop them as young leaders. He was a trainee on Picton Castle in 2016 and added: “Having done a similar experience myself I knew how much the cadets would be able to grow and learn from this experience. Dr. Craig Nikolai, Project Management, Tall Ships Bermuda 2017 & Sail Training Association of Bermuda, has been very impressed by the character and maturity demonstrated by all of the Sea Cadets with whom he has come in contact. “I knew SLt [SCC] Bennet from our days and nights volunteering as technical divers with Ocean Support Foundation when it was in its infancy. “When I agreed to help bring life to Tall Ships Bermuda 2017 in support of our youth and the Island’s history of sail training, as a trained educator, I was blown away. Commander Frith and his team have a world class programme, and it shows in the quality of their cadets. “We are proud to have Sea Cadets representing Bermuda as trainees during Rendez-Vous 2017 Tall Ships Regatta. I only wish there were more of them so we could fill all the empty berths in each port with Bermudians. As a former Sea Cadet, TS Bermuda (Pembroke) I had similar opportunity in 1976 joined the NRP Sagres (Portuguese sail training ship) on the last leg between Bda and New York. The ship taking part in the American bi-centenary celebration that would end with flotilla in NY Hudson river July 4th 1976. Then we sailed to New Port R.I. and spent two weeks there partaking in various events, joined by many other tall ships from many countries. Could have stayed with the ship for recrossing the Atlantic back to her home port in southern Portugal but did not have correct entry visa documentation to enter Portugal. Great time learned a lot all at the age of 14 would do it again in a NY minute. All I can say to these young folks make the best of it enjoy yourself and new the friends you will make. I guarantee you will remember every detail of the adventure years down the road.